So I’ve gotten into the habit of skipping class once or twice a week, watching lectures at home while trying to catch up on random errands. There’s always emails to write and plenty of cleaning/tidying up to do. It’s a surprisingly pleasant way to spend my time, made even more so by the knowledge that days like those, home alone, working on and off at my own leisurely pace, will be exceedingly rare past the next year or so. Among the many random things I do in my spare time is cooking, or rather, baking (I cook real food fairly sporadically/rarely, but I favor large batches that last me at least a week). Last Wednesday was bread, which I wish I’d taken a picture of since it was my first loaf ever. I think I’ll make it again this weekend because it was delicious and I’d forgotten how much I love good bread. Yesterday’s project was biscotti. I confess, these are the only two I covered with chocolate, and they’ve been mailed off to my mother, who is in the US till Monday. They’re supposed to be almond biscotti, but I was out of actual almonds so they just have the flavoring. Still, delicious! 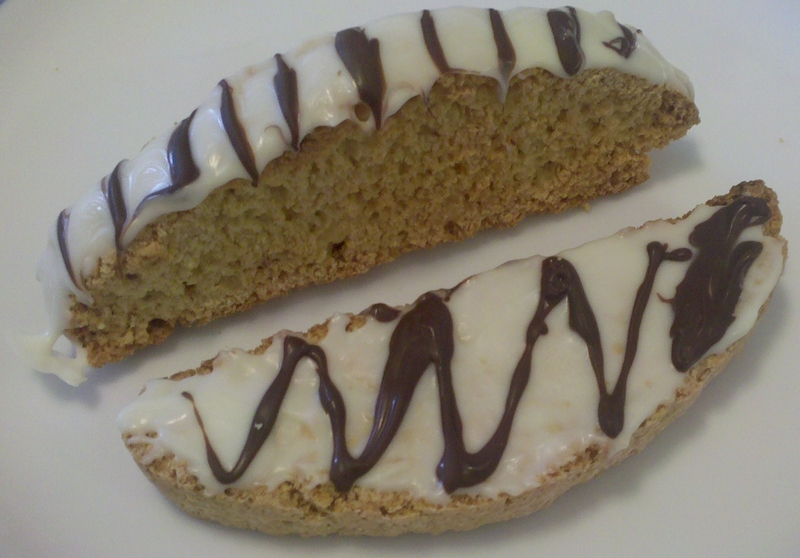 I haven’t had biscotti in a really really long time now, and I was really happy to learn that homemade tastes just as good as, if not better than, store bought. Here’s the recipe. I also crochet, which is a very off and on again hobby. My oldest older brother had a baby in November, so last night I finally finished the blanket I was making for her. It’s pretty big, at least 2′ x 3′, I think, if not bigger. 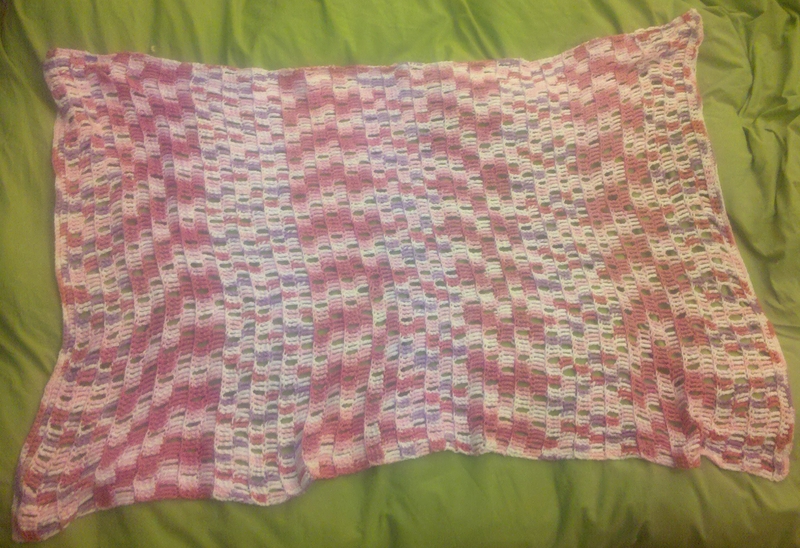 It’s made from cotton yarn though, which I will not be using again for blankets. As great as natural fibers are, I might have to stick with the synthetic yarns. The cotton wasn’t nearly as soft as I had hoped and it was a bit difficult to work with. Weaving in the ends discretely was such a hassle! It’s pretty at least? It’s not quite as warped as it seems in the picture. It was damp, I was tired, my bed’s not the best surface for picture taking, and I needed to mail the blanket early the next morning so I had to take the picture then or not take one at all. No pattern for the blanket. It’s just triple crochet all the way through except for the first two and last two rows, which are single and then half-double crochet. All pictures courtesy of my brand new Motorola Droid, by the way (and thank you to my older brothers for this wonderful Christmas/late birthday present!). I should post about it, considering I posted on trying to decide what phone to buy. I love it, though I can’t say that I could say much bad about a device that allows me to carry the internet in my pocket. A friend of mine has a food blog, and while I don’t think I could aspire to post as frequently as she does with pictures as pretty as hers (for one, I don’t even own an actual camera right now, just a phone with a camera and a flip ultra hd) of food as pretty as hers, it reminds me that pictures are a nice addition to a blog, so I might do this more often. I love to make things but I’m very much a jack of all trades, master of none. I just want to know if I’m capable of doing various things so I try them a few times, but I’m often not interested enough to master anything (running theme in my life…).